Have you considered taking private Pilates lessons and settled on mat classes at the gym or at-home videos? Ever wonder if you're exercising correctly, or feel you need to make modifications for an injury that you have? Or have you gotten injured some other way and can't do your normal workout anymore? Whether or not you already have an exercise routine, Pilates can be that routine, or it can be the foundation to your regular practice of running, swimming, cycling, dancing, gardening, etc. You're a perfect candidate for private Pilates lessons. Starting with Reason #1 below, continue to follow this blog to find out the many reasons why you should invest in private lessons. Do you feel like you don't have the money to spend on private lessons? To put things into perspective, think about the money that you are spending, or could spend, on injuries or illnesses down the line, if you don't take the preventative actions now. Physical therapy, chiropractic, acupuncture, doctor's bills, surgeries, specialists, massages, diets, prescription medication, to name a few, can eat holes in your wallet. I'm not trying to say that these things aren't necessary if you do Pilates, but Pilates can greatly reduce the number of visits to the chiropractor, physical therapist, doctor, etc., and can prevent surgeries. I refer clients out to these sources when I feel they need more than what I can offer them. I communicate with chiropractors and physical therapists who my clients see so that we're on the same page. For my personal health, I love my acupuncturists, massage therapists, and physical therapists. They are part of my health team. But I also take private Pilates lessons in addition to other forms of exercise, so that I can apply what I learn in Pilates to moving safely, effectively, and pain-free. Invest NOW in your health, because it will help you in the long run to have a healthier life, rather than spending the later years of your life in pain, or on prescription drugs. This goes for what you eat too..but that's another story. This is just the exercise part of the "healthy living" picture. 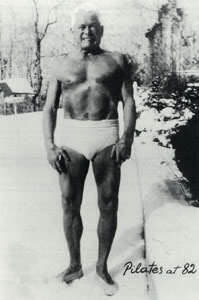 Joe Pilates, pictured here, lived to be 83, which was pretty good for being born in 1883. He was not a healthy child, and had asthma, so he dedicated his life to the study of Contrology (now called Pilates) and to improving his health. There are many more reasons why you should do private Pilates lessons on equipment. You'll learn that it's important to have the guide of a trained professional, especially starting out. Cisco Pilates offers great New Client Specials. We'll cover more reasons to do private Pilates lessons in the next blog posts.